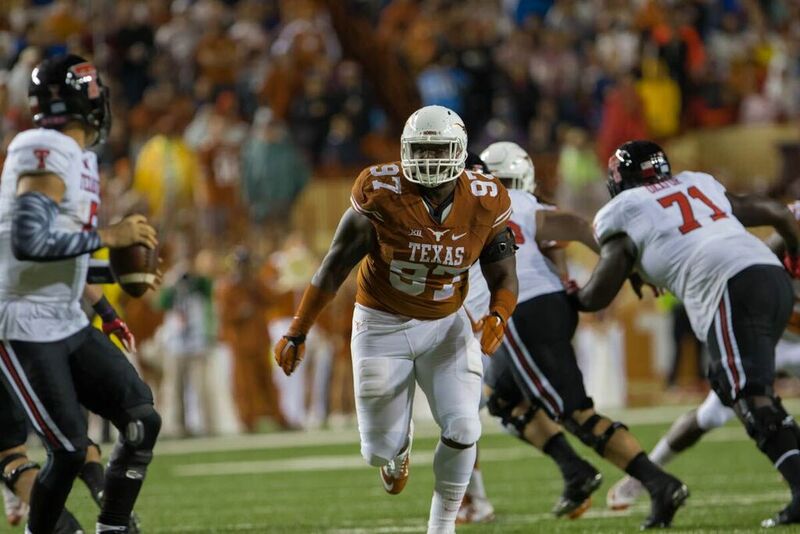 Texas took another offseason hit when defensive tackle Hassan Ridgeway declared for the NFL draft this month. It’s easy to get caught up in what Ridgeway wasn’t (a worthy heir to a tradition of DT dominance) and miss out on what he did bring over the last two seasons. In 2014, he stepped into a gap left by Tank Jackson’s injury and played nose tackle, thus freeing up Malcom Brown to play the 3-tech/4i-technique on the outside. Despite regularly facing double teams inside, Hassan was able to post 43 tackles, 11 tackles for loss, and six sacks while freeing up Brown to add another 72 tackles, 15 tackles for loss, 6.5 sacks, and be selected in the 1st round of the 2015 NFL Draft by the New England Patriots. 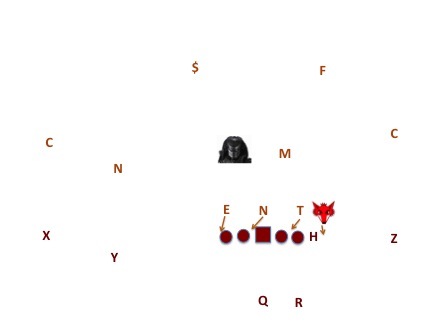 In 2015, the defense became about Ridgeway, at least nominally, with the redshirt junior moving outside into Brown’s 3/4i-technique position. While battling injuries half the year and working with surrounding players that couldn’t free him up as he had done for Brown, Ridge added another 36 tackles, 6.5 tackles for loss, and 3.5 sacks. That may not seem like much but ask around the Big 12 and you’ll find more than a few teams that would love to have that kind of production from a defensive tackle, especially one who’s numbers were diminished by missing games to injury. Now he’s gone, which begs the question of where Texas looks to find an impact performer along the DL that can protect a still young LB corps and make the five-man pressure packages the nightmare for opposing OCs to scheme against they were in 2014. What does Texas need from the DL? Texas basically has three positions that really classify as “defensive linemen” in Charlie’s base defense as the Fox is usually pretty free on the edge, even in the four-down sets. With Brick Haley around the Longhorns actually moved away from running as much Under fronts and mixed in some Over, the differences of which you can see below. 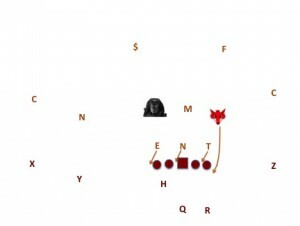 Here’s the Under front, the basis of which is that the strong side of the offense (which is the side that has an extra blocker), features a 5-technique strongside end and a 1-technique nose tackle. On the backside you have a 3-technique defensive tackle and a weakside end who are freed up by this defensive design to ruin plays from the backside. This is what the Over often looked like for Texas, the difference from the Under being that the side of the formation with an extra blocker (the strongside) is where the 3-technique would align along with the Fox while the nose and 5-technique would be on the weakside. Complicating all of this is the fact that Texas often aligned their defensive tackle to the boundary and their strongside end to the field and then stunted into either of these fronts from the 3-3-5 nickel package. With that said, each position requires certain skill sets to work optimally. Ideally Texas would have a nose tackle and then a pair of ultra-versatile DE/DT players on either side of him who could all fit a few different roles but Charlie hasn’t had a chance to build this DL in accordance with his eventual vision yet. In the Under front, the nose tackle is arguably the most important position. In the 3-3 alignments, this player needs to be able to slant into either A-gap, beat the center to the spot and command a double team, and then hold up the double so that the guards don’t get a free shot at the Texas inside linebackers. In the Over front the nose tackle isn’t run on as much and a speedier guy who can fill the backside A-gap can be more his game than trying to command a double team on the playside. Even still, you’d like him to be able to withstand a double team without getting blasted into the linebacker’s lap. Next we have the DT, who’s going to play primarily in a 3-technique (in between the guard and tackle) or a 4i-technique (shaded across and inside from the tackle). In the Under front this player is a disruptor, free to run plays down from behind and rush the passer from the same side as the weakside end or Fox, who’s ideally the team’s best pass-rusher. In Texas’ 3-3 Under he may also be stunting outside and occupying the guard and tackle so that the Fox can loop inside and get a free run at the QB. In the Over this player becomes more of a crucial piece to the run defense puzzle as he needs to be adept at splitting double teams, maintaining the point of attack, and covering up the linebackers. The strongside, or field end, in the Under front is a cross between the Under 3-technique and the Over 3-technique. He needs to be able to set the edge, potentially face a double team (although from a TE and OT rather than an OT and OG), and be a disruptor on the edge. At times this scheme will call for him to stunt inside like a 3-technique and stunt in conjunction with a blitzing linebacker but his specialty should be working on the edge. In the Over front this player usually moves over to weakside end while the “strongside” end is the Fox and he’s able to stay on the edge more and chase plays down from the backside. As you’ll notice, the Over front puts a premium on having a really good 3-technique defensive tackle who can free up athletes virtually everywhere else while the Under front relies heavily on having sturdy players at nose-tackle and strongside end with the aim of unleashing great athletes at the 3-technique position and at weakside end (Fox). Strong’s 3-3 fronts make the nose tackle’s position arguably more difficult while also setting up the defense to make use of tweeners at either end/tackle spot outside of him with the stunts and shifts serving to help them get into position. Who’s left on the roster? 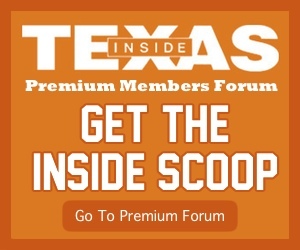 There’s a good chance that one or more of Texas’ incoming freshmen in 2016 will be put to work in the DL rotations, but there’s a very poor chance that one of them will be a starter or a featured piece. The hand-fighting techniques and overall strength that these positions require combined with the varying assignments that can come in the 3-3 front against different opponents will weed out freshmen very quickly next fall. 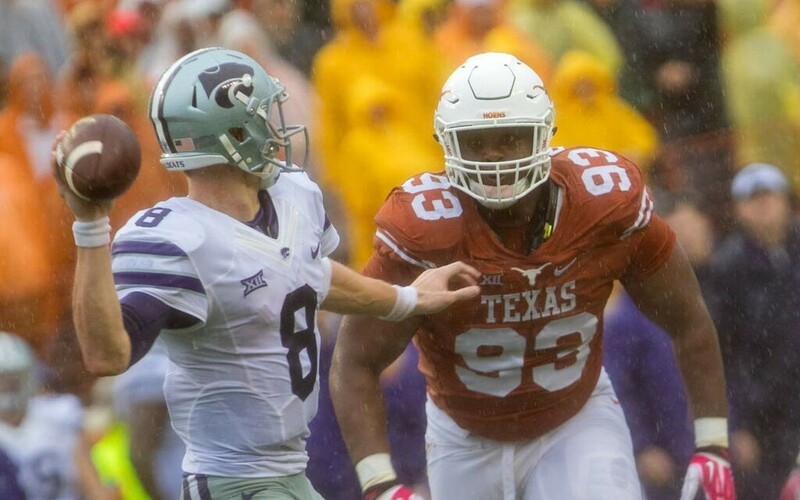 Here are the guys that will need to play major roles for the 2016 Texas DL. Boyette finally got his chance to be an important contributor in 2015 and was solid as a rotational player, contributing eight tackles for loss and three sacks on the year serving in both the 3-technique and nose tackle positions. Boyette is quick enough to be a disruptor when slanting into gaps but he lacks the ideal strength and ability to anchor to serve as a nose-tackle or Over 3-technique. Against Baylor he was routinely blown off the ball by Bear double teams trying to fill the A-gaps as a nose, which really complicated matters for Texas’ young LBs trying to figure out the difficult run schemes Art Briles called in that game. He’s probably most valuable as a 2nd-teamer who can step into either DT spot and provide adequate snaps in relief. Thank God Cottrell is back as he was really starting to put things together last season with 6.5 tackles for loss and four sacks while splitting time with Shiro Davis. He’s made his home at strongside end and with some growth in the offseason at stunting into interior gaps, he could really be an effective player here next season. His strength is in setting the edge or running plays down from the backside and he’d probably be best as a weakside end in an Over front but he is solid as a strongside 5-technique as well. Expect Texas to feature him in their stunting blitzes next season. The days of Santos playing LB are probably long gone now with the emergence of several faster and more instinctive players at the position. He could factor into the strongside end rotation if he could actually get his weight up to 260 or so (where it’s listed on the roster) and if he showed an aptitude for playing on the edge. We’ve not seen much of anything out Quincy Vasser yet and since his seven game appearances in 2015 eliminated the chance of a redshirt you get the clear sense that they are just allowing his eligibility to run out. Ford is quickly proving to have been one of Charlie’s most important recruits as he’s now in the position to be a primary part of the 2016 DL in a make or break year for Strong. Ford’s specialty is slanting into gaps and causing problems either by getting upfield at the point of attack or running plays down from behind after dashing past the attempted reach blocks of backside OL. He had six tackles for loss and 2.5 sacks doing exactly that last season while playing behind Ridgeway on the depth chart. He’s a great fit as an Under front 3-technique but he’s quick enough to play on the edge some as well which makes him a nice fit for this scheme in general. Texas played him some as an Over 3-technique last year but his effectiveness is greatly blunted when he’s trying to work against double teams and he can’t escape the reach and size advantages of his opponents by moving his feet. 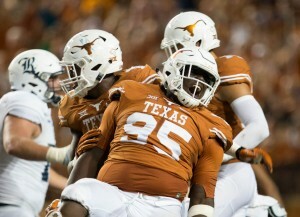 Nelson only played sparingly in 2015 and many of his snaps were at the boundary end, 3/4i-technique position occupied by Ridgeway and Ford when he played in relief against Baylor. He’s not a bad athlete at all but that was hardly the right position for him since he’s not a guy you want to regularly ask to play contain on the edge. Nelson is probably the best chance Texas has at a true nose-tackle who can stand his ground against a double team without getting blasted into next Tuesday. He’s quick enough to take a gap from a head’s up position across from the center and if he can learn to consistently play low, he should be able to force the double as well. There’s no telling if and where McMillon might figure into the 2016 rotation in his redshirt sophomore season after playing OL as a freshman and then moving back last year. Perhaps he’s sturdy enough to play double teams inside but you wonder how quick he is after bulking up to play OG. Bedford named Roberson the best pass-rusher on the team during the season so it would seem that it’s run defense, being consistently assignment-sound, and quality players ahead of him at Fox on the depth chart that keeps Texas’ young DE off the field at this point. He could maybe grow into a strongside DE with time but it’s more likely that he’ll bide his time and become an edge weapon who’s freed up by other players occupying space in the trenches. I’ve always had Omenihu pegged as a strongside end in Charlie’s scheme but he was pushed into action at Fox as a true freshman and he flashed some lateral agility and ability to navigate in space that I honestly didn’t expect. He still figures to grow into a SDE and probably won’t look like a bulked up player with his lanky frame until he’s at least 270. He’ll factor into the 2016 season somewhere because this kid is a natural football player with a nose for the ball. It’d be pretty hard to find a DL in the JUCO ranks this late in the recruiting season who could be reasonably counted on to offer much. Last year Texas snagged Vasser late in the process and we saw how that turned out. Even worse, Texas’ greatest need would be for a true DT that could play the 3-technique or nose positions and those are generally the hardest to find. From the 4-3 or 3-3 packages this group is best served by playing more Under fronts than Over with the hope that Nelson grows into an All-Big 12 caliber nose tackle this offseason (plausible) while Ford and Cottrell are unleashed in opportunities to slant or own the edge respectively. It’s hard to escape the conclusion that Texas will be rather thin along the DL next season and potentially rather poor unless Strong’s two 2014 DL (Ford and Nelson) come through in a major way. The staff may have to tinker and experiment with some alternative defenses next season, but we’ll get to that another week when we talk about the Fox ends and various LBs that Strong will get to play with next season.